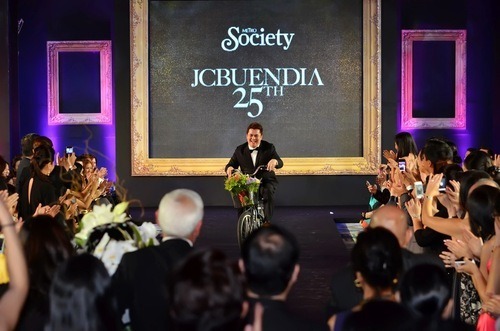 As promised, here are photos of JC Buendia’s 25th! As much as I tried to keep you updated with photos from my camera phone (it was the only thing that could fit my clutch that night), these photos are way better. You can really appreciate every design. 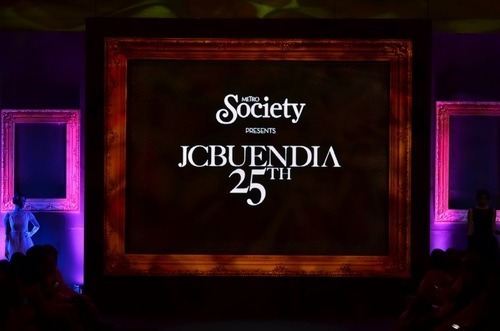 Needless to say, JC Buendia is a fashion genius. 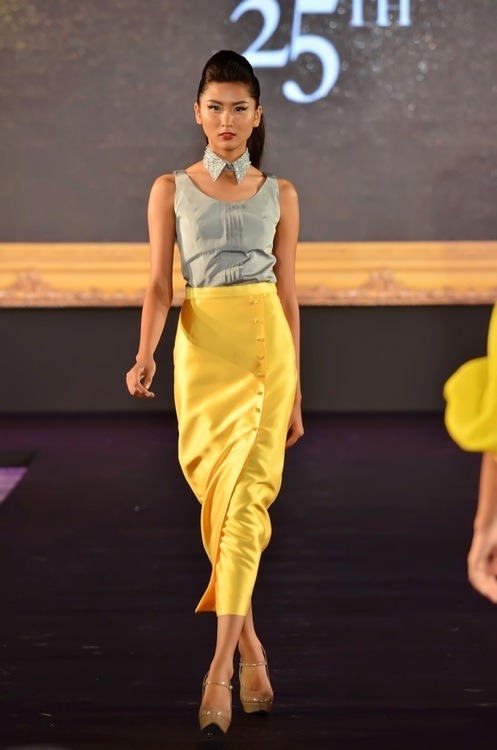 His designs are effortless, timeless and oh so chic. Thanks to photographer Daniel Tan, Visions & Expressions and TRESemme for the photos. 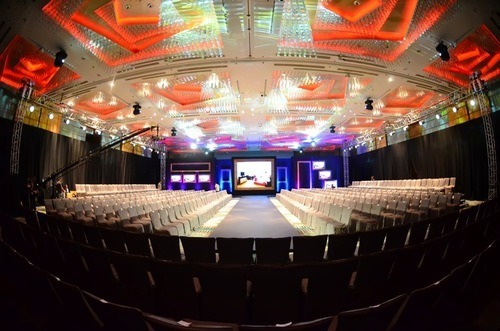 The gala show was held at the Marriot Hotel Manila. 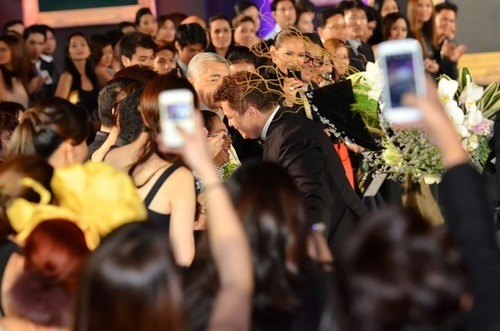 It was hosted by Karen Pamintuan. 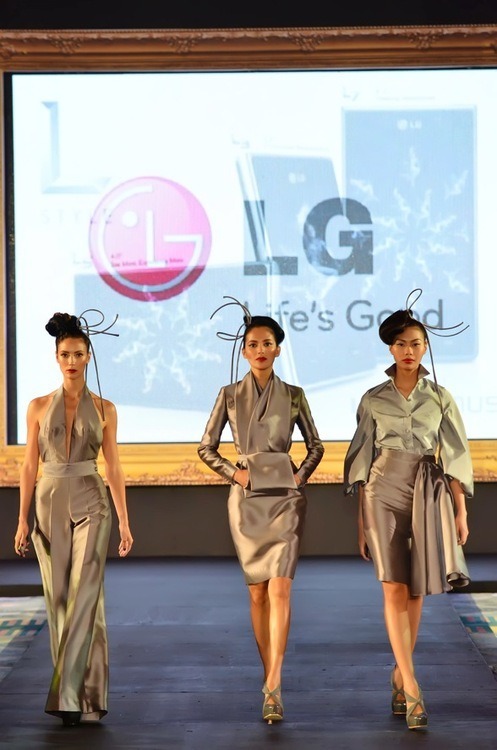 The show was sponsored by LG. 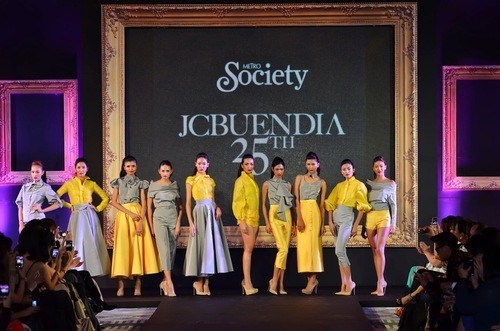 These JC Buendia designs were inspired by the brand. And now, the show begins. 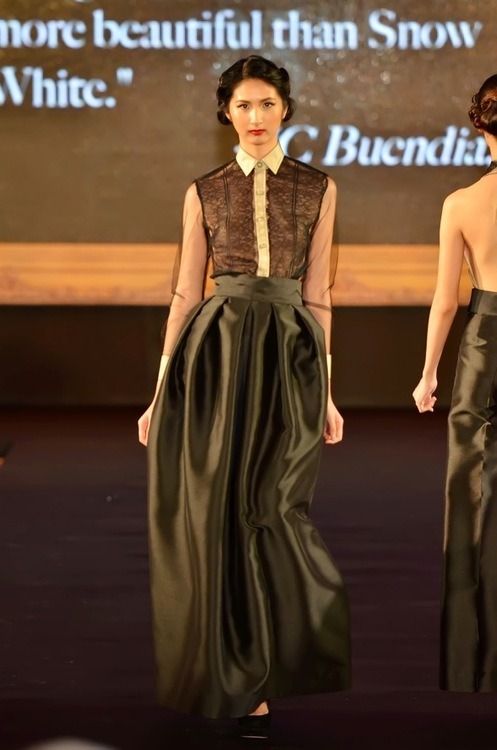 For this gala show, JC Buendia was inspired by classic Hollywood films. 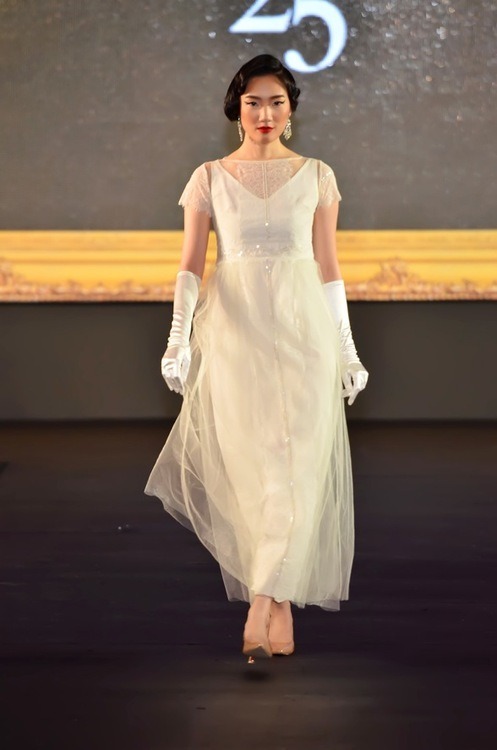 This chic white number looks like it came straight out of a Grace Kelly movie. A lovely black version comes out right after. 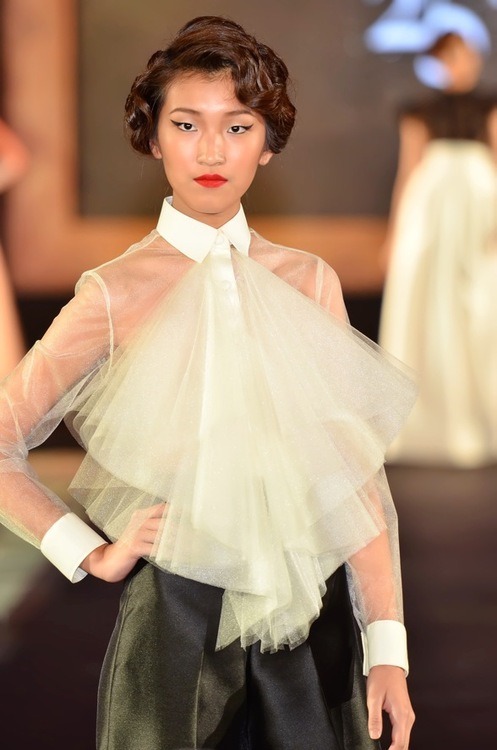 He certainly found a love for tulle, as we can see with this pretty sheer top. Lace is all the embellishment you’ll need with this outfit. A closer shot. Love the details of this. This reminded me of modern-day barong. 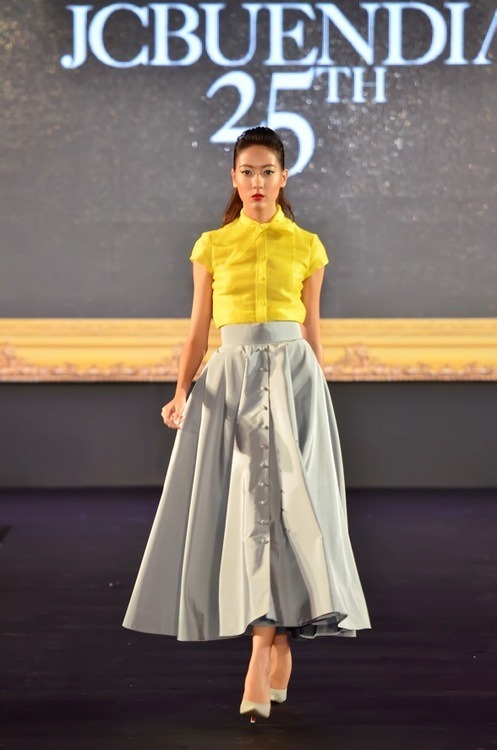 It looked so good with this ballgown skirt. More dreamy tulle. The length is so old Hollywood. The drop-waist is very 1920’s. Love his take on this. JC shows us that the wide-length pant is a fitting option for a formal event. Love the hair and makeup. TRESemme did an amazing job with the hair. Another classy black and white ensemble. This style is truly enduring and classic. Yellow and gray seems to be another favorite of JC’s. This skirt is so pretty. Paring gray on gray looks quite modern. JC’s take on casual wear is still very streamlined. Loving this top. It looks very chic and versatile. These attachable collars are adorable. And so is this mid-length skirt. JC makes sparkly short shorts look very classy. The yellow and gray collection. 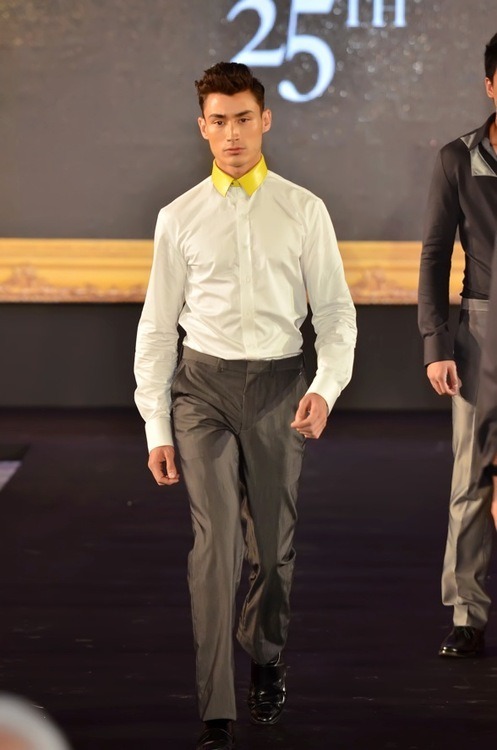 Men’s fashion. Don’t they look sharp? Here’s a properly tailored suit. That yellow collar makes a statement. Love this. 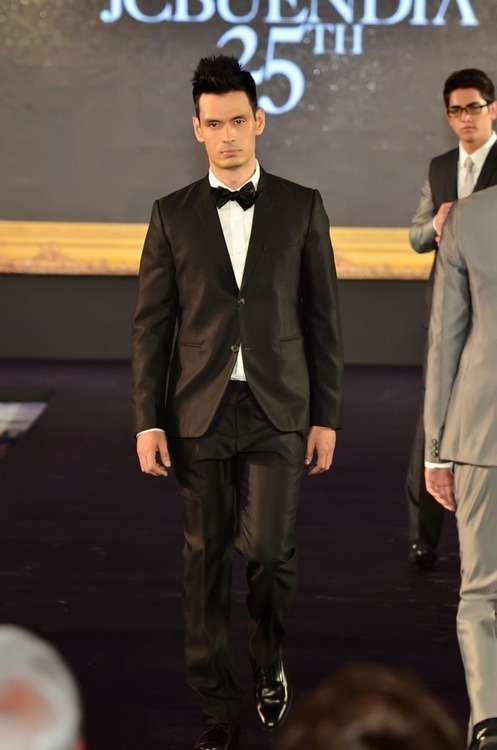 A great-looking tuxedo for a black-tie event. This textured jacket is love. A structured coat that is also good enough to wear as a dress. Up close. Every inch is perfection. This multi-paneled skirt has interesting detail. Another version of the textured coat we saw earlier. JC’s designs always look so elegant and proper. Notice the back detail on this skirt. Laser-cut sleeves make an amazing detail for this ensemble. Classic black dress with a huge ribbon detail. 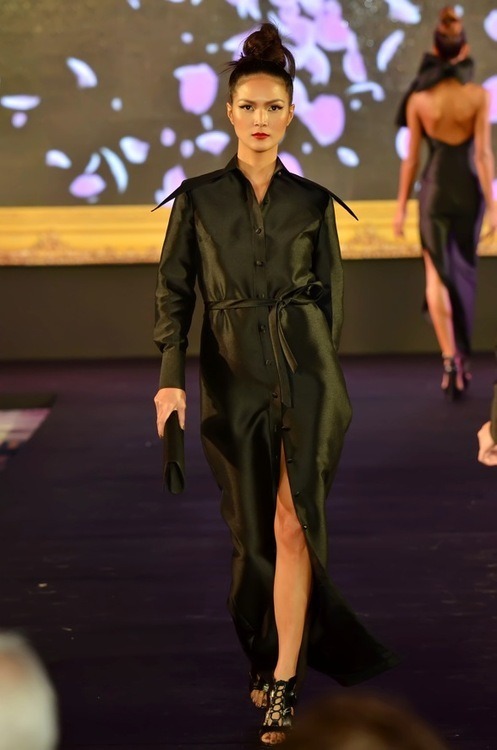 This long coat is so sleek and pretty. 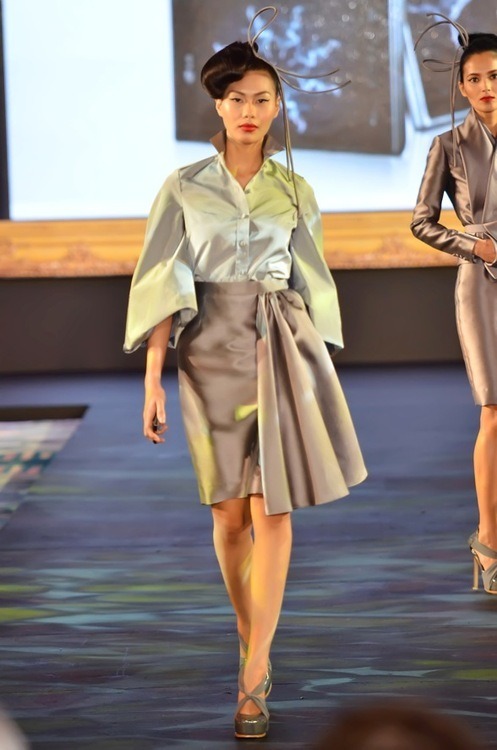 This button-down dress reminds me of a chic trench coat. This yellow sparkly gown looks amazing. 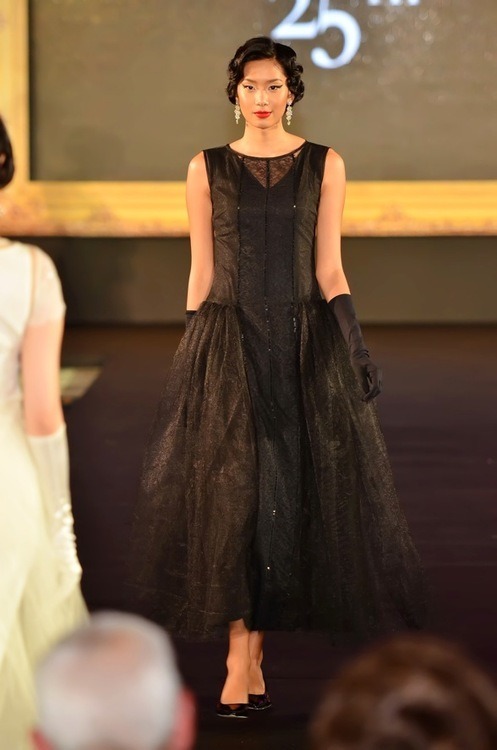 This black dress was my absolute favorite. 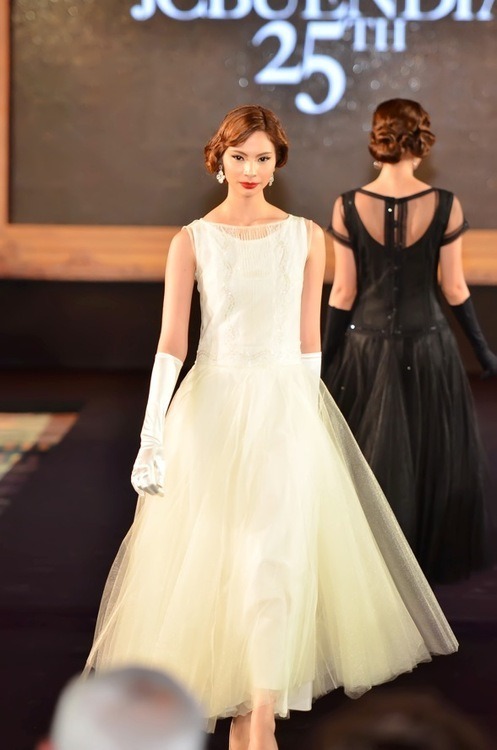 It is so Audrey Hepburn! The backless design looks stunning. This is another favorite of mine. What an amazing formal coat! 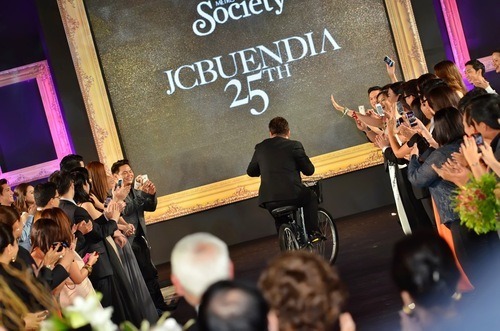 And here is the man of the hour: JC Buendia who came out riding a bicycle. So sweet: he kisses his mom. And off he goes. 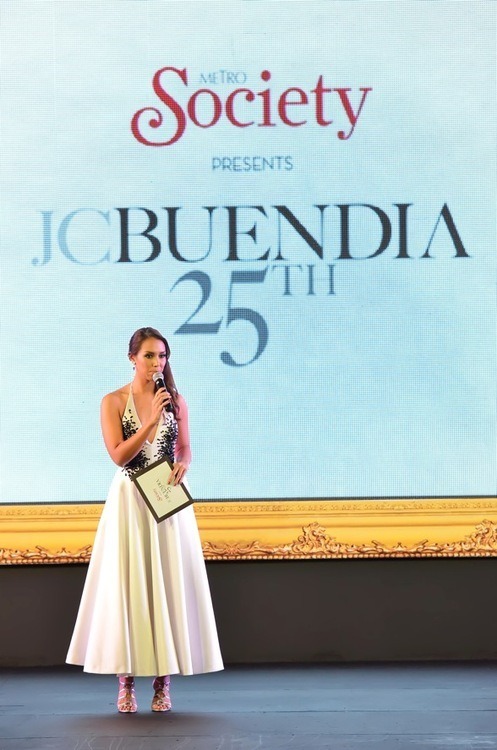 Here’s to another 25 years in the fashion industry. 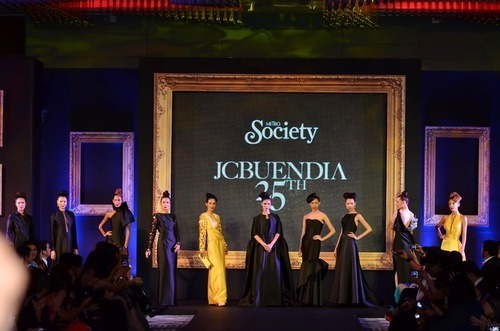 Congratulations JC Buendia, and kudos to Metro Society for an amazing show.